The Mississippi State Department of Health (MSDH) has released the following information regarding public health issues resulting from the Gulf oil spill. State Health Officer Dr. Mary Currier said "We will provide updates on the public health aspects of this situation as it develops." At this point, the oil spill is not expected to affect public drinking water supplies or private well water. Any fish available for commercial sale, for example, fish in grocery stores, comes from noncontaminated waters. Contaminated fish and seafood will not be allowed on the market by regulatory agencies. However, based on common sense, if a fish obtained from any source smells or tastes like oil, do not eat it. Consider staying indoors, ventilating your home with air conditioning, and avoiding strenuous outdoor activity. If these symptoms do not improve, or if you are experience severe nausea or other medical issues, you should then consider contacting your primary care physician or other health care provider for medical advice. EPA responders began portable monitoring of air quality on April 28, and began water sampling on April 30. Aircraft were deployed to collect air sample data and provide aerial photographs and will continue tracking. The results of EPA's sampling efforts will be posted at www.epa.gov/bpspill. EPA will make recommendations for the public to take based upon the results of environmental monitoring. 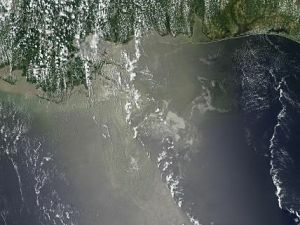 In addition, the Center for Toxicology and Environmental Health (under contract with BP) is monitoring air quality between Venice, Louisiana, and Pensacola, Florida. Based on what we know, if exposure is brief, long-term health effects are not anticipated. Do not swim, ski, or paddle a surfboard in any waters visibly affected by oil. Do not drive your boat through oil slicks or sheens. Enjoy walking on the beach and in the surf, but heed any beach advisories, and use common sense. Avoid any areas with visible oil. You should avoid direct contact with the oil, or oil-contaminated water or sediment. If you get oil on your skin, wash it off with soap and water. Wash your hands before eating to avoid accidently swallowing oil. If you get oil on clothing, wash it as you normally would. Harsh detergents, solvents or other chemicals are not needed to wash oil from your skin or clothing, and their use is discouraged. The Mississippi Emergency Management Agency has opened a call center to answer questions regarding the oil spill...1-866-920-6362.